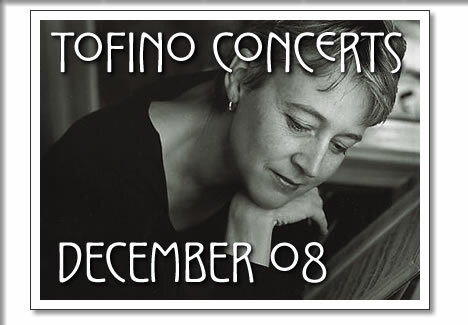 The following concerts in Tofino are happening in the month of December 2008. Tickets are available at Tofitian and Long Beach Surfshop in Tofino. Join us for an evening of music, song and great food to celebrate Tofino Talented Ladies. Favourite Female Chef, Lisa Ahier of SoBo, will create a special menu of Tapas for the evening. Featured performers Anne Klazek, Julie Robinson and Hailz of Doom will be joined by other local favourites throughout the evening. Pianist Jane Coop is one of Canada's most prominent and distinguished artists. She has toured extensively throughout North America, Europe, and Asia as recital and concerto soloist. Major orchestras around the world, including the Royal Philharmonic of London, all the principal orchestras of Canada, the Seattle and Oregon Symphonies, the Hong Kong Philharmonic and the National Taiwan Symphony Orchestra, have featured her as soloist in some forty concerti--from Mozart and Beethoven to Barber and Bartok. She has appeared as solo recitalist in many of the great halls of the world: Lincoln Center, Kennedy Center, Wig?more Hall, Salle Gaveau and the Great Hall of St. Petersburg in Russia, performing an extensive repertoire. Next season, she will give her twelfth performance with the Toronto Symphony. Mixing Indian classical rhythms with Persian improvisation, setting Arabic melodic modulation in a Persian mode, and adapting African melodies to a Westernized improvisational structure, Sangha maintains focus on clarity and subtlety so that each element sings out individually as well as collaborates and converses with ease; in this way, these four masters in their own right beautifully demonstrate the alchemical fruition of simultaneously bowing to the past, the present and the future. With moments of extreme delicacy followed by passages of deeply passionate, determined conviction, their music sincerely reflects the meaning of their name: a group of people who come together with a common bond; in this case, it is one of phenomenal musicianship and a reputable, shared musical vision. Tofino Winter Surf: Bigger is Better! Tofino concerts in December 2008 from Tofino Time Magazine. Shows at the Tofino Legion and other music events in Tofino.